I went on a brief Michael Robotham reading spree last month, and was quite taken with his books. I had not realized the books were part of a series, featuring two of the same characters. One of the things I particularly liked about the three books I read by Robotham was how different each was from one another, including being written from different perspectives. Each can be read as a stand alone. I was especially drawn to these books because they are set in London, England, one of my favorite crime fiction settings. You can learn more about Michael Robotham and his books on the author's website. Bombproof was my first Michael Robotham novel, and it was quite an intense ride. Sam MacBeth has recently been released from serving time in prison for a crime he did not commit. Only, the bad guys don't know that. They think he's something he's not. As a result, he gets mixed up in a plot that can only lead to more trouble. On the run from the police who think he is a terrorist after the train he was on blew up, Sami must find a way to clear his name. Unbeknownst to him, he has a little help on his side. Retired police detective Vincent Ruiz is also on the case. Bombproof is on the violent side. The author pulls no punches. It is dark and at times quite crazy. Yet, there is also a bit of humor mixed in, which takes some of the edge off. Sami is one of those guys you can't help but feel sorry for and want him to come out on top. Source: I received an e-copy of these book for review from the publisher via NetGalley. Say You're Sorry is the harrowing story about two missing girls, one of whom turns up dead after three years. A couple is also found murdered in their own home. Police have a suspect in custody, but clinical psychologist Joe O'Loughlin, who has been asked to question the boy, is pretty sure the young man is innocent. Joined by ex-police detective Vincent Ruiz, Joe sets out to find out who the real killer is and to try and find the other missing girl before it is too late. In this particular novel, the reader gets a more intimate glimpse into Joe's life and why his marriage fell apart. The mystery into the girls' disappearance is quite disturbing, particularly in how they were being forced to live. It brings to mind Ariel Castro in Ohio and the girls he help prisoner for all those years. 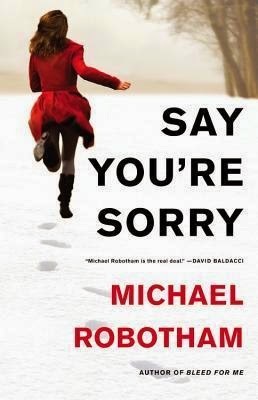 Say You're Sorry was just as good as the other two novels and kept me guessing until the end. There were quite a few times throughout the novel in which I had to hold my breath. I probably should have read Watching You after I read Say You're Sorry, but I did not pay close enough attention to publication dates. While both books stand alone, an event in Say You're Sorry, is mentioned in Watching You--so you might want to read them the other way around if back story is important to you. In Watching You, Marnie Logan finds herself at the center of a lot of death. All evidence points to her when her bodyguard ends up dead. Her husband has been missing for more than a year and, the deeper the authorities dig, the more skeletons they dig up from Marnie's past. Only, Marnie swears she is innocent. Her psychologist, Joe O'Loughlin, is sure she is innocent and begins his own search into her past. He enlists the help of his friend, retired police detective Vincent Ruiz. I was thrilled to see Vincent Ruiz again because I liked his character in Bombproof quite a bit. He isn't afraid to kick in doors and throw a few punches to get the answers he wants, but he also has a soft side to him. He is ever the skeptic and and is loyal to the truth. Joe O'Loughlin didn't make it into Bombproof although his name is mentioned. He is very good at solving crimes, even though he's sworn that part of his life off. Vincent and Joe reminded me a little of Jonathan Kellerman's Alex Delaware and Milo Sturgis, whose books I once read like there was no tomorrow. Watching You was another intense read, full of twists, both the expected and unexpected. Michael Robotham does a good job in this book of making the reader suspect just about everyone under the sun as being the culprit behind the murders, including the Marnie herself. I love it when a book can keep me guessing until the end. I need to try his work! I can stand to see or hear about violence but somehow reading about it doesn't bother me. Kathy - I am less tolerant of violence than I used to be, but some doesn't bother me. In this case, it was enough to mention, but not enough to really bother me. I really liked Missing You, which was my first by Robotham. I'm adding Say You're Sorry to my list! I liked Joe and Vincent and want more of them. A very popular author amongst my friends, I really must read his books though I think I may give Say You're Sorry a miss. Tracy - I like what I've read so far of his books. They are entertaining mystery thrillers. I understand wanting to skip Say You're Sorry. It's not a subject matter that will appeal to everyone. So these are all part of the same series? They sound really good. Becca - From what I can tell, the second two books, Say You're Sorry and Watching You, are part of a series--but both stand well on their own. Bombproof features one of the series characters, however, I am not sure it is actually part of the series. I got the impression it was purely a stand alone. I've never read Michael Robotham but now I want to. I do enjoy darker thrillers and these sound good. I also like it when these types of reads keep me guessing. Great reviews! Stacy - How neat that you got to hear him speak on a panel! I wouldn't mind meeting him. Maybe one day he'll come to the L.A. Times Festival of Books. I really love London as a setting for crime fiction too! I know I read one of his books but I definitely would like to try this series. Isn't it fun when you find a book you really enjoy and you go on a mini-reading marathon reading other books by the same author? Iliana - I do too! I have yet to visit there, but maybe someday. It is fun to go on little reading marathons. I need to do that more often--maybe to catch up on some of my series reading. I need to read this author! I have two of his books, The Drowned Man and Bombproof, in an omnibus edition. Your review makes me want to run out and find the other two books and read them asap! They do sound good. London is good for any setting! lol It's my favourite big city, and I often think it is a character unto itself, it looms so large in the world. Susan - I would love to visit London one day. I agree, it definitely is a character unto itself! 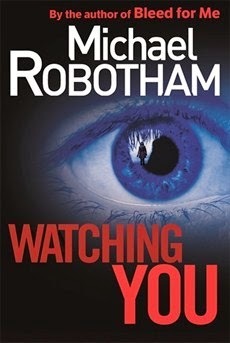 I hope you do get a chance to read something by Robotham!